Click to listen to song samples. 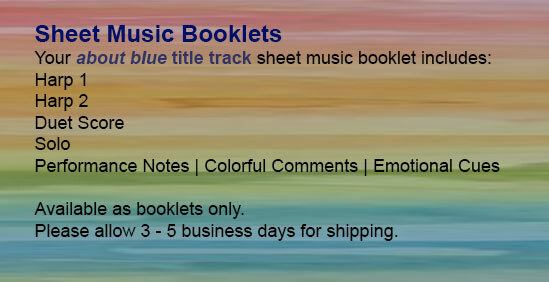 Click to view what is included in each booklet. Click to learn more and preview sample. Click to view what is included in each download. 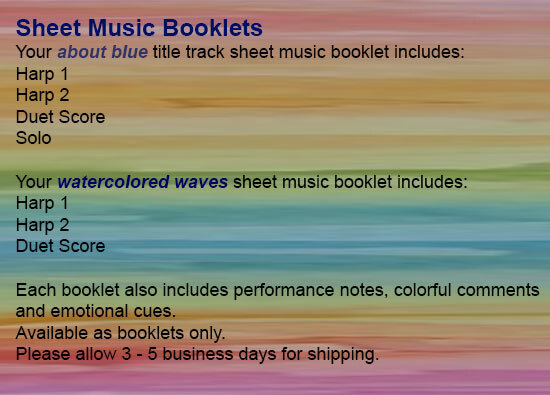 To order directly from Watercolor Harps, place a check next to each item you wish to order then click the Add to Cart button. 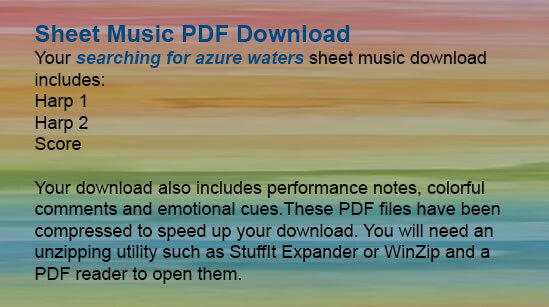 Click on the small image to view and print your sample harp music. "Playing relaxed tones of blue can open your spirit to life's possibilities." The color blue symbolizes trust, strength and dignity. Blue captures timeless beauty and evokes feelings of dependability and calm. Watercolor Harps hopes this piece splashes its way onto your list of favorites. This piece can be played on lever or pedal harps and also allows players to work on their own interpretation and dynamics. Think of the phrases as cresting waves. The written description “effervescent rolls” under the beginning chords means play the rolls with a fizzy, bubbly feeling. Soak in the moment. Like the color blue, water represents a variety of emotions. Picture yourself standing at the water’s edge, then open your spirit to the possibilities of life. The expansiveness of water can be very comforting. Sense the lapping waves and dipping your feet into the cool waters. This piece captures that special feeling of being near the water. "Playing refreshing tones of blue can create a soothing oasis." Cues are written in where possible to help players get music in hand more quickly. The bass line is written one octave higher to accommodate smaller harps with fewer strings. All duet parts are works in progress. 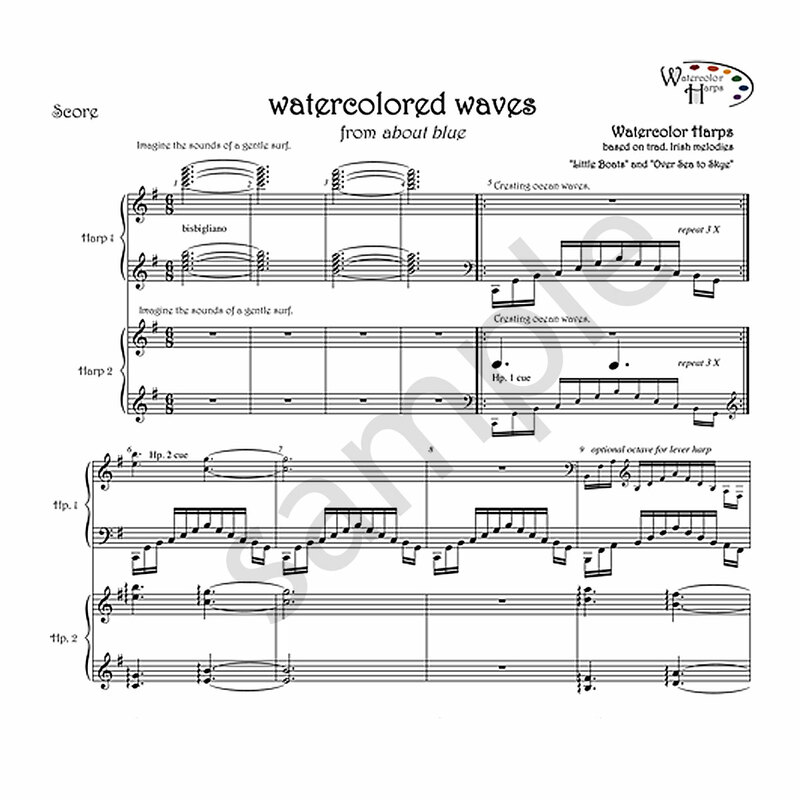 Add your own interpretation and create your own "watercolored" sounds. Like the color blue, water represents a variety of emotions. Imagine the sounds of a gentle surf... cresting ocean waves...sometimes gently moving side to side, as if rocking in a boat... even sailing over the water. 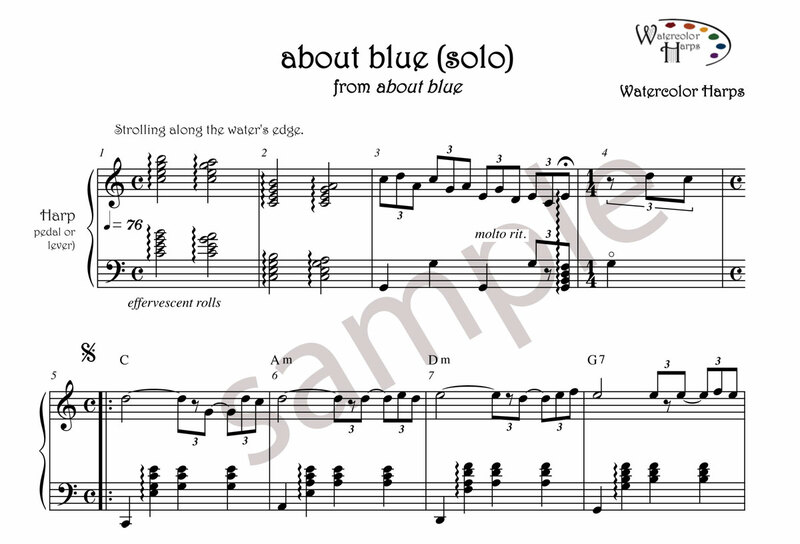 This piece has been designed in duet form (not available as a solo) to compliment the player’s styles and distinctive harp sounds. Both harp parts have to work together to achieve an overall balance. Experiment with the call and response between the harps. This piece captures how distant and expansive the horizon over the water can seem. 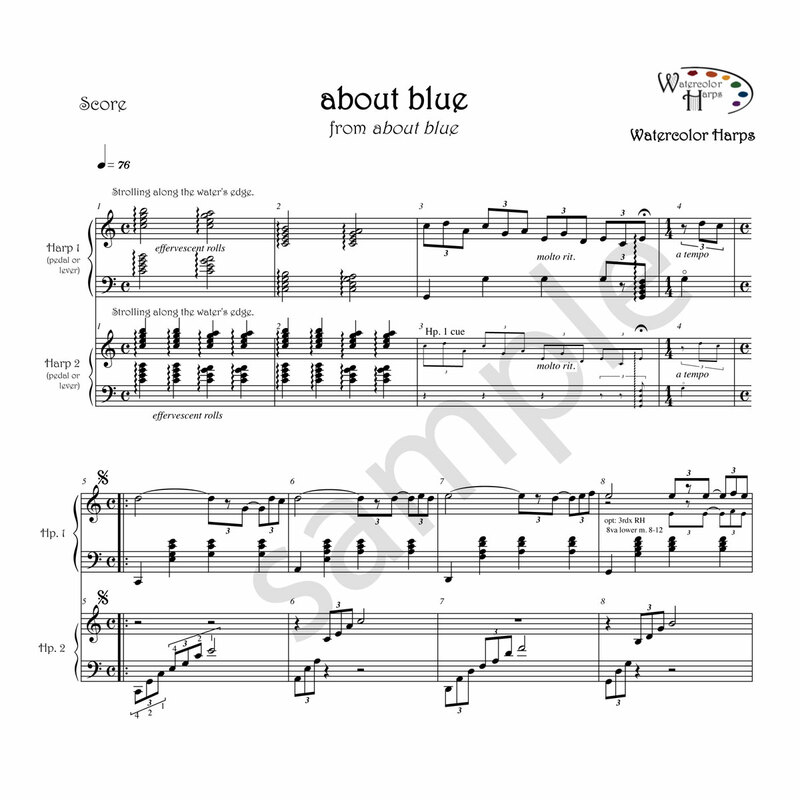 The distinction of this arrangement of Arran Boat Song from others is that Watercolor Harps purposely stays on one musical idea for a longer period of time and soaks in the emotional oasis. Open up your soul and immerse your senses to what lies beyond the blue horizon. Imagine a clear blue sky over shimmering water: floating in the surface; diving below the surface; sailing above the surface; the gentle rocking of a boat; dipping your feet into the cool waters along the sandy shores. about blue captures that special feeling you get when you are close to such places. The musical artists of Watercolor Harps invite you to escape into their impression of the color blue. 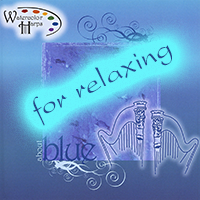 Just as an artist uses different elements when creating a masterpiece, Watercolor Harps has painted a musical odyssey using combinations of various harps, colorful chords, Lake Michigan waves, unique keyboard sounds and syncopated styles to take you away to your blue. A special thanks to their husbands and families for their loving support and patience throughout this project. about blue, the first in a series, was written for them. Harpists Tammy Naze of Algoma and Cheryl Murphy of Green Bay have blended a fusion of Celtic, Classical, and Christian styles into Watercolor Harps. This labor of love and friendship, inspired by the sights and sounds of living near the shores of Lake Michigan and Green Bay, is something they hope splashes its way onto your list of favorites.